I ended last week’s post with a question to all you runners out there: have you ever cheated during a race? Our society frowns on cheating while also encouraging it at the same time. Think I’m wrong? All you have to do is go to the grocery store check-out line to see that we have a warped relationship with cheating. Hollywood star cheats on starlet: details inside! Or how about this one: Cheat on your diet and still lose the weight! Cheating is rampant in any number of areas in our lives: school, work, taxes, marriages, the world of academics, politics and sports. Those of you who follow this blog know by now that I’m an avid track and field fan. I hate cheating in the sport, and most likely, if an athlete has been banned for a drug violation at some point in the past, I (and many others) will not readily forget. It’s hard to cheer for someone who cheated once upon a time, and it’s hard to cheer for those whose physique suggests there’s some illegal enhancing going on, even though they haven’t been caught … yet. If you have to cheat to win, you don’t deserve to win. And not only that, you take away the glory from a clean athlete who finished behind you. Clean athletes like Adam Nelson, for instance, who just recently received the gold medal for shot put from the 2004 Athens Olympics because the Ukrainian who originally bested him (in a tie-breaker) got busted for performance-enhancing drugs. It took until 2012 to catch the cheater and strip him of his medal. And it was sweet and bitter to watch Nelson at a recent meet where he was recognized as the gold-medal winner from nine years ago. The structure of testing within elite track and field organizations exists to catch cheaters. But what about the regular folks out there running and racing? Who catches the cheaters among the rest of us? Last summer, The New Yorker published a fascinating story about a suspected cheater in the world of marathon running: a dentist from Michigan named Kip Litton. He’s suspected of cutting courses short (lots of them), thereby cutting his times, too. Why on earth would a dentist from Michigan feel the need to cheat in marathons? What drives a normal person to think this is okay? Sometimes it’s easy to cut a course short by accident. There’s no marking or volunteer at a critical turn. 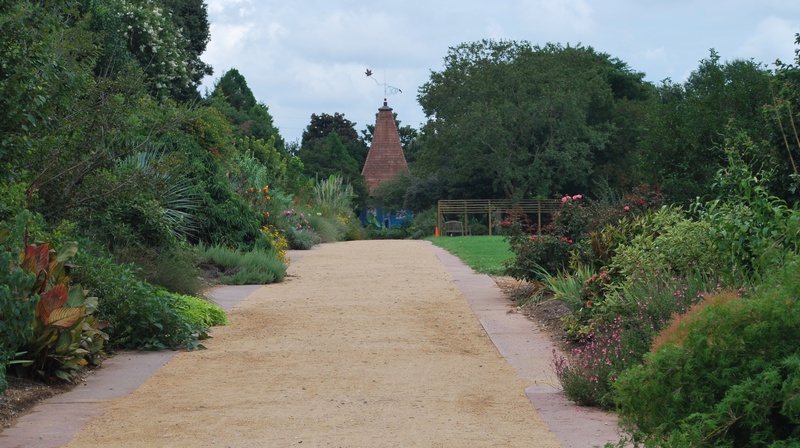 You’re following the runners in front of you, trusting they know which way to go. A course turn is marked incorrectly. I’ve done it by accident before. I’ve also run a course long by accident for the same reason. But to cut a course on purpose? And still cross the finish line pretending I had run the whole race? I can’t imagine feeling good about myself after that, and I can’t imagine the need to win being so much greater than the need to be honest that I’d cheat to get a better place. But I guess for some, a hollow victory is better than a clear conscience. My 5K didn’t have any confusing intersections, and other than turning around too early, it would have been hard to cut the course. So that wasn’t the problem. But a man walked away with a trophy for the third place overall female finisher. He wasn’t just picking up the trophy for a wife or girlfriend or sister who couldn’t stay for the awards. He simply accepted a trophy that shouldn’t have been his. If you’ve ever run a road race and stayed around long enough afterward for the awards, you know that the awards ceremonies afterward can border on chaotic. The folks in charge of timing and results scramble as fast as they can to sort out the finish order and the age group awards, and the race director hands out the awards as quickly as possible. At any point in the process, human and computer error can insert themselves and indicate that the wrong person should get an award. I don’t know where the mistake first happened in the race in question. Maybe a volunteer keyed in the gender from the man’s entry form wrong, or maybe he actually registered as a woman. But his accepting the trophy compounded the mistake and put a damper on an otherwise pleasant race. The 24-year-old woman who should have won the trophy may not have even realized there was a mistake. The only reason I knew of the problem was because the 5K and 10K courses overlapped enough that my husband passed me headed in the opposite direction as I was running back toward the finish. He had counted the women ahead of me, and I kept track of how many women I passed after that and how many passed me. So I knew how many women should have been ahead of me in the results. But when the results were printed, there was an extra “woman” ahead of me. I paid extra attention during the awards. I’d like to think the guy took the award not realizing it was for the third female finisher. He might not have been paying attention to the race director until he heard his name. But then, I’d like to think Olympic-level athletes wouldn’t resort to drugs to gain an unfair advantage, too. To all the cheaters out there, I say “Shame on you.” For those tempted to cut a course and still claim an award, or those pretending to be the opposite gender or a different age to get an award more easily, and for those elite athletes facing the decision to take drugs or not, this Bible verse might be a good reminder not to: “You were running well; who hindered you from obeying the truth?” (Galatians 5:7). Here’s to obeying the truth and feeling good about your efforts, even if they don’t bring home any trophies. When I was six years old, I held my mother’s hand while we gleefully smashed the tiny acorns that scattered the sidewalk in front of our church. When Lopez Lomong was the same age, he was ripped from his mother’s tight grip, taken by soldiers from under the trees where his family and others from surrounding villages had been in prayer during a church service. I was born in America. Lomong was born in southern Sudan (now South Sudan). To quote Robert Frost, “That has made all the difference.” It’s a difference I can’t begin to grasp. 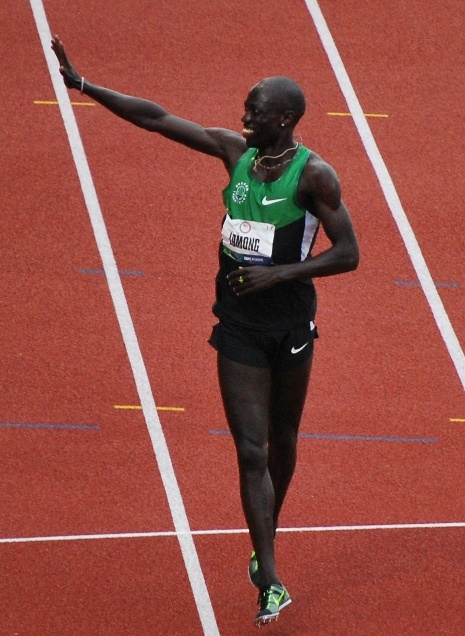 Lomong is one of my Olympic heroes, representing the USA in two Olympics – in 2008 in Beijing where he also served as flag bearer in the opening ceremonies and again this past summer in London where he came in 10th in the 5,000 meter final. I feel blessed that I got to see him earn a spot on both the 2008 and 2012 teams, watching him race at the U.S. Olympic Track & Field Trials in Eugene, Ore.
Lomong runs a victory lap after winning a spot on the US Olympic team this past June in Eugene, Ore.
Lomong’s story is nothing short of amazing: from being abducted by soldiers in war-torn Sudan to living in a refugee camp in Kenya for 10 years to a journey to the United States where he would become a citizen and live out his own version of the American dream while never forgetting the other boys and girls left behind in Sudan. 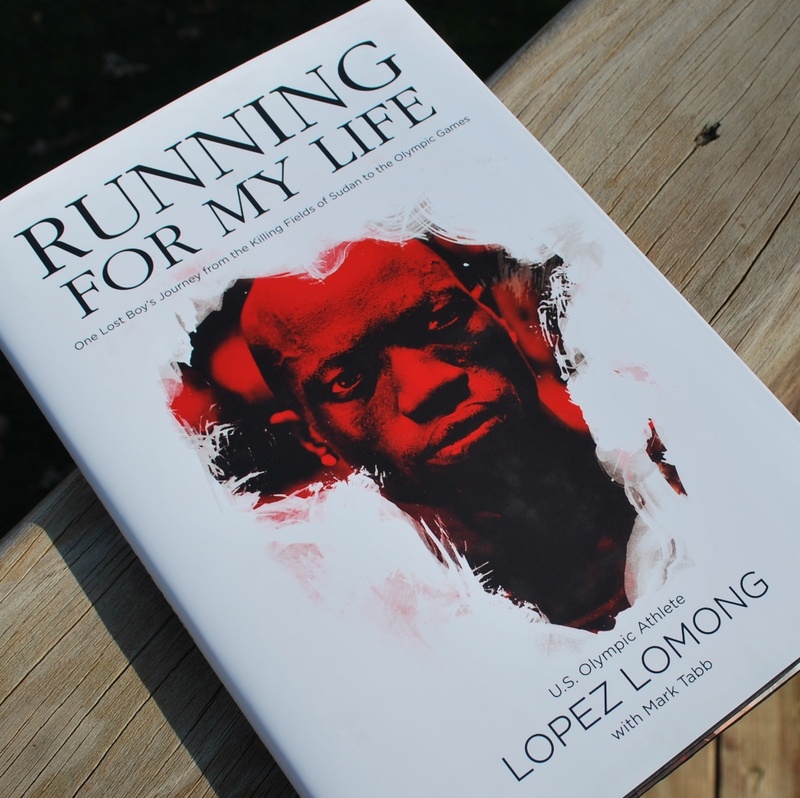 Lomong has shared his life – its struggles and triumphs – in a moving memoir published last year, called Running for My Life. Never has a book title been so accurate. Running saved his life. Those of you who have followed my blog for any length of time know that I’m an avid track and field fan, and so I’ve been pretty useless this week – an unusual couch potato-ness setting in thanks to the Olympics. 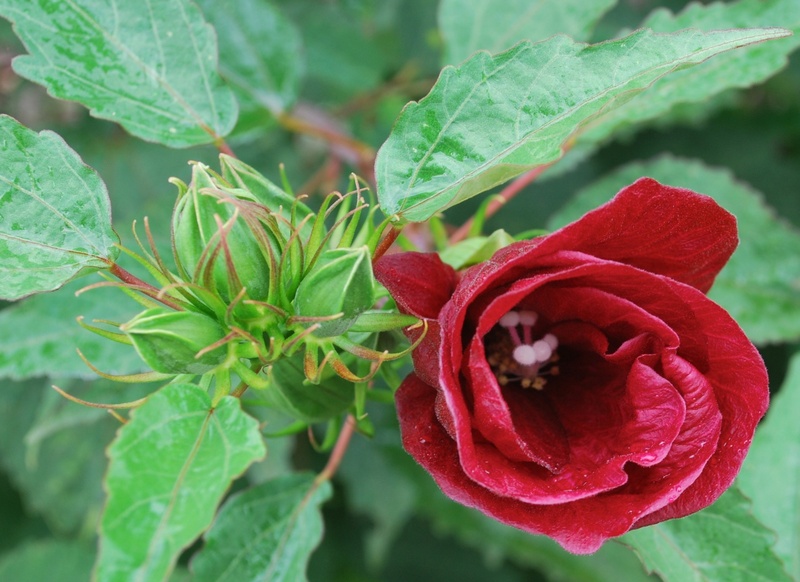 On Friday, in between the morning and afternoon sessions of track and field, I tore myself away from the TV and live Web streams to meet a friend at a nearby arboretum. The beauty that surrounded us as we walked and talked was breathtaking. That beauty got me off the couch and out of the house yesterday – this time with camera in hand. So for today’s post, I’d like to share some images of the beauty I might have otherwise missed by spending too much time watching others run and throw and jump. This week, I’ve been taking a closer look at the courage of Deborah, a prophetess who was one of the judges of Israel before they had kings to rule over them. Judges 4:5 tells us that she sat under the palm tree of Deborah, where the people of Israel sought her out to settle their disputes. Of course, I haven’t only been concentrating on Deborah’s story this week. The Olympic torch and anthem beckon, and though my beloved track and field events don’t start until Friday, I’m glued to the TV and internet more than usual these days. I admire the competitors’ courage to compete on this global stage, their courage to transform their hopes and dreams and sacrifices into reality at these games, and their courage to face harsh questions if they fall short of their goals. Show of hands: How many of you would be brave enough to face the other end of Andrea Kremer’s microphone at the London Aquatics Centre? There’s another test of courage going on during the games, and that’s the courage of faith. Faith can be a deeply personal experience, and there are competitors who have a strong faith in God but who won’t display their faith openly. There are others, though, who feel called to put their faith story out in the open. Whether quiet or loud, competitors may find their faith tested at the Olympics.